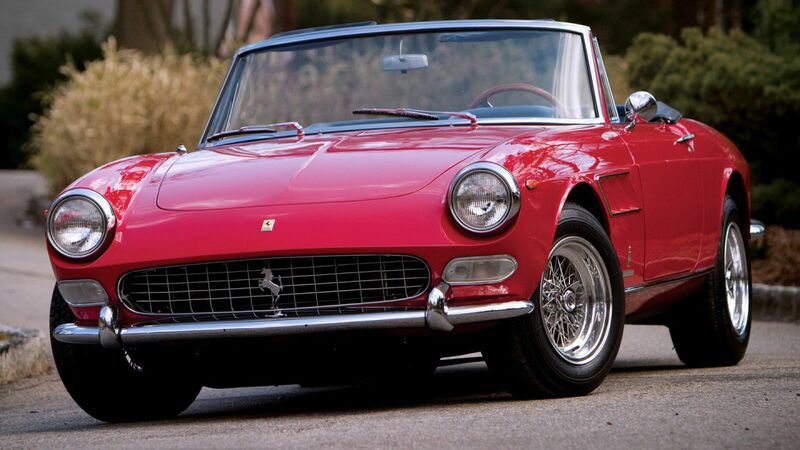 Driving a 275 GTS, one is faced with the choice to enjoy a discreet and elegant convertible, signed by an artist such as Pininfarina, or feel the power of a Ferrari machine that can make you suffer sweetly. At the Paris Motor Show 1964 in which Ferrari had to present to the public his latest street gran turismo, the advertised 275, Modenese manufacturer’s stand as presiding two unknown cars, but totally and apparently different. At least her body in little or no agreed, except, of course, universally known in the shield mark on the hoods, the famous Cavallino rampant. Perhaps the surprise was not new but two? It was. One represented the pure sports style house: a spectacular berlineta reminiscent of the victorious and curvilinear sculptural 250 GTO (1962) 250 LM (1963). The other was a convertible with a more conservative and lightweight design, especially in the three front rooms, where features of the GT 250 Coupe and Cabriolet 1958 Their names were distinguished. 257 GTB GTS 275 the first and the second. Two different mechanics for same lines, so foreshadowed the numeral “275″, as was the tradition at Ferrari, was for the unit cylinder engine. Two bodies, he said, but signed with the same name: Pininfarina. The Italian master had also been asked to wear the surrogate model of the unique and profitable (for the prestige it gave his brilliant career Ferrari) 250 GT, whose appearance dated back to 1956 and the Pininfarina himself made several stylistic interpretations and beautiful . Under those two designs, the 275 GTB and GTS concealed, however, like a mechanical approach, and in some respects, new. Enzo Ferrari had convinced finally to abandon the continuous line followed in technical terms in their standard model. True, the results supported his idea; there is palmares achieved. But the thrust of competition forced to take a step forward. The 250 GT, which we described before profitable business and by advertising, remember riding a modified version of the V12 designed by Gioacchino Colombo and Loris Bazzi in 1947 and a rigid rear axle with leaf springs. Without ignoring the structure of the primary cell of the frame, consisting of two strong beams. Compared to a car very close to us, the Pegaso Z-102 (1950-1955) was light years ahead, technically speaking. A V8 engine with dual overhead camshafts, camshaft per bank of cylinders, supercharged by two compressors in one or a few variants, dry sump lubrication, Dion rear shaft to the gearbox, differential, brake assembly is anchored to the departure of the latter and a monocoque frame made were some of the contributions of Spanish technical illustrious Wifredo Ricart this Gran Turismo. Then what remains to be determined dynamically exceeded. The Ferrari clearly demonstrated; Pegasus did not have time for socio-political issues. But that is another matter and material for a comparative future. The 275, now before us, was a major qualitative breakthrough. Tourism introduced in Maranello independent suspension on all four wheels and transaxle arrangement called, ie front engine and gearbox and differential form a block in the rear. A fine tree, with rigid joints, transmitting motion from the clutch to the box. Only these two new configurations, driving and dynamic performance won many integers. In addition to greatly increase the ride comfort, weight distribution improved the robustness of the assembly (the entire stiffening element mechanically exerted from the motor since four points is bolted directly to the frame and the differential housing into three) and therefore, it became more stable in ordinary steerable road. Especially when the power increase also announced significant. The nth evolution of V12 ‘Colombo’ received for the 275 GTB/GTS Type 213 designation On paper, the basic architecture remained unchanged. Motor V at 60 short stroke block and heads alloy, a camshaft in each cylinder head, carburetors generous battery (three double Weber), a displacement increased to 3.3 liters, enough power: 280 hp and 260 the berlinetta (with a quieter distribution diagram) the spider. The press of the time was full of praise when describing the progress evidenced in the Ferrari 275. Focusing now on the variant convertible to be starring in this article, the technical editor of the American publication Roads & Track held its testing in a journey through Nevada, covering 680 km in five hours, including, as commented a refueling stop and two for cooling himself. Then stood in their ratings of comfort, confidence and perceived safety at all times; the excellent work of suspensions, engine power and pleasant, without tiring at all, which was run with the top down, listening without discomfort typical Ferrari V12 bellow.